Today is Friday November 11th, Veterans Day. There are not enough words to adequately express our gratitude to all the servicemen and women, past and present, who selflessly serve to protect our country. We can not be the “Land of the FREE” without being the “Home of the BRAVE!” So please accept our heartfelt thank you. We honor you today…and everyday. Today is also 3 weeks since I lost my Dad, my hero. He was a paratrooper in the Army and one of the strongest men I knew. I am still in shock that he is no longer here. It was only 17 days after he was diagnosed with a glioblastoma that he was gone. During the days in the ICU after brain surgery he struggled to regain the use of his left side, his ability to swallow and his speech. But the surgeon was not able to remove the entire tumor and it was just too aggressive. Yet, through it all, my dad maintained his sense of humor and graciousness. When asked how he was doing, he always answered “Pwetty good,” even though he had 65 staples in his head and no use of his left side…not to mention a dire prognosis. He showed no anger or much fear of what lied ahead. He just wanted to get home and makes those around him smile. Several times he would look me straight in the eye and say “YOU.” Since he was known for his jokes, I would answer “You-Who?”…and anxiously awaited the punchline. But then he would quickly doze off. This happened at least a half a dozen times in the hospital but was forgotten during the hectic first few days after we got him home under hospice care. Then all of a sudden, while all his grandkids were in the room, Dad decided he not only wanted to sit up in bed but to get OUT of bed (first time in 2 weeks). I truly believe he wanted to show his grandkids how strong he still was. So with the help of my brother and my son we got him up in a wheelchair and rolled over to his favorite spot. I was kneeling by his feet looking up in his face to see his crooked smile of achievement. Then it seemed like it was just the 2 of us in the room and he whispered “YOU”. The tears began to flow because at that very moment I was reminded of the last conversation I had with my mom just 7 months earlier. She was sitting on the couch less that 10 feet away from where we sat. She didn’t have the strength to even open her eyes. But she was smiling so sweetly. I asked what she was smiling about and she answered with a simple “YOU”. It was just a few hours later that we got her in the hospice bed and began administering meds every hour to keep her comfortable. During those last days with my mom, Dad and I had a conversation. He hugged me and thanked me for taking care of her. Then he bowed his head and said, “I hate to ask this of you, but could you do the same for me if the time comes?” Of course, without hesitation. He struggled for a moment and said “What kind of father asks that of their child?” I told him, “A father who raised his daughter with unconditional love. I love you Dad and I will be there for you in a heartbeat just like you were for me. No matter when, how or for how long.” Who knew I would be honoring that promise just a few short months later. So after we got Dad back in bed and after all the grandkids left I was able to tell Dad again how strong he was. Then I noticed deep in his eyes how very tired he truly was. I knew then it was time for me to muster up my own strength and to tell him it was okay now to let go. “It’s time to rest, time to let us take care of you. We love you. Mom loves you and is waiting for you. And there is someone who loves you even more than we can imagine and you get to spend eternity with Him. You don’t have to be strong anymore…just rest.” Dad never opened his eyes again. But his body continued to labor for another 5 days…another testament to how strong he was. Now we are faced with trying to move on without both our parents. It was an honor and a privilege to care for them in their last days. Now it’s our responsibility to honor their legacy and maintain their beloved farm. It’s a huge commitment and a lot of work. But they cherished their little piece of heaven on earth. 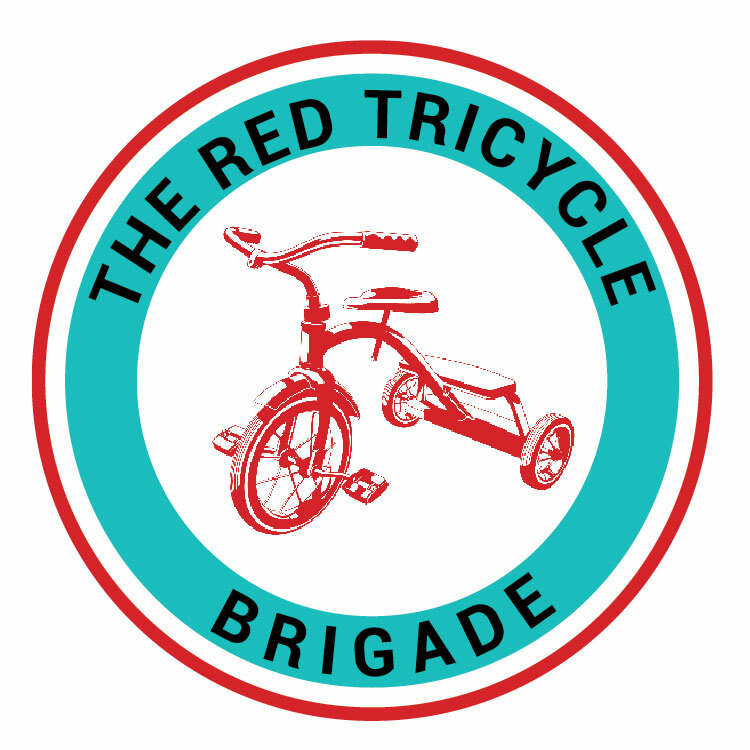 So with that being said, I will be taking a short break from The Red Tricycle Brigade. The weekly Facebook posts and the monthly First Friday kindness themes will be put on hold for a short time. But don’t fear…the brigade will continue on. Our number one event and the catalyst for creating the brigade in honor of Henry is coming up soon: the annual toy drive for Randall Children’s Hospital where Henry spent so much of his life. We will again be collecting toys in January to be delivered on February 9th. Last year we collected over 2,500 toys. The tricycle may be parked for the time being, but we hope that what we represent…KINDNESS…will continue to roll on through all of our followers. If you feel compelled please share your acts of kindness on our Facebook page and start collecting toys now. Thanks again for your understanding, support, generosity and KINDNESS! Pam, the tears flow. What a gift to give your parents, the ability to die in peace at their home. A testament to what amazing people they were, to raise a daughter like you. Love you!